For the release of Batman Arkham Knight, Sony have announced a limited edition console bundle that will be made available. 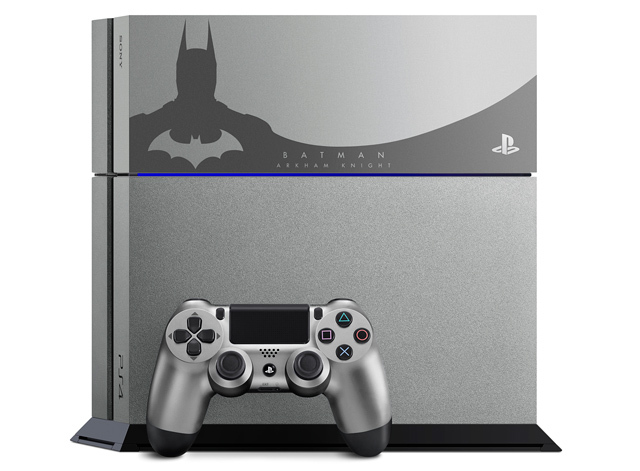 Sony’s US PlayStation blog revealed the Batman themed console, available in the US and EU. The special bundle will be made available for $449.99. It includes a limited edition Steel Grey PS4 System with a custom Arkham Knight faceplate, a matching DualShock 4 and a copy of Batman Arkham Knight. Up until this point most limited edition PS4’s have just had custom faceplates. It’s nice to see Sony finally doing something interesting with the LE’s. In addition to this limited edition console, Sony also announced that all bonus content for Arkham Knight will be made available on PlayStation 4 first. This includes additional in-game missions, and custom skins for both Batman and the Batmobile. Batman Arkham Knight will launch worldwide on the 23rd of June 2015 on PlayStation, PC, and Xbox One.